Suricata uses the Yaml format for configuration. The Suricata.yaml file included in the source code, is the example configuration of Suricata. This document will explain each option. At the top of the YAML-file you will find % YAML 1.1. Suricata reads the file and identifies the file as YAML. By default the runmode option is disabled With the runmodes setting you can set the runmode you would like to use. For all runmodes available, enter –list-runmodes in your command line. For more information, see Runmodes. For the max-pending-packets option, Suricata has to keep packets in memory. 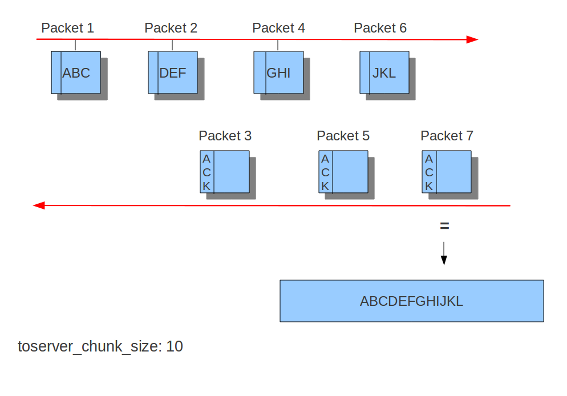 With the default-packet-size option, you can set the size of the packets on your network. It is possible that bigger packets have to be processed sometimes. The engine can still process these bigger packets, but processing it will lower the performance. This option sets the name of the PID file when Suricata is run in daemon mode. This file records the Suricata process ID. This configuration file option only sets the PID file when running in daemon mode. To force creation of a PID file when not running in daemon mode, use the --pidfile command line option. Also, if running more than one Suricata process, each process will need to specify a different pid-file location. If a signature matches and contains pass, Suricata stops scanning the packet and skips to the end of all rules (only for the current packet). This only concerns the IPS/inline mode. If the program finds a signature that matches, containing drop, it stops immediately. The packet will not be sent any further. Drawback: The receiver does not receive a message of what is going on, resulting in a time-out (certainly with TCP). Suricata generates an alert for this packet. This is an active rejection of the packet. Both receiver and sender receive a reject packet. There are two types of reject packets that will be automatically selected. If the offending packet concerns TCP, it will be a Reset-packet. For all other protocols it will be an ICMP-error packet. Suricata also generates an alert. When in Inline/IPS mode, the offending packet will also be dropped like with the ‘drop’ action. If a signature matches and contains alert, the packet will be treated like any other non-threatening packet, except for this one an alert will be generated by Suricata. Only the system administrator can notice this alert. Inline/IPS can block network traffic in two ways. One way is by drop and the other by reject. Rules will be loaded in the order of which they appear in files. But they will be processed in a different order. Signatures have different priorities. The most important signatures will be scanned first. There is a possibility to change the order of priority. The default order is: pass, drop, reject, alert. This means a pass rule is considered before a drop rule, a drop rule before a reject rule and so on. The second scenario is where multiple sections are migrated to a different YAML file. If the same section, say outputs is later redefined after the include statement it will overwrite the included file. Therefor any include statement at the end of the document will overwrite the already configured sections. In the /var/log/suricata directory, all of Suricata’s output (alerts and events) will be stored. Engine statistics such as packet counters, memory use counters and others can be logged in several ways. A separate text log ‘stats.log’ and an EVE record type ‘stats’ are enabled by default. The stats have a global configuration and a per logger configuration. Here the global config is documented. # Add decode events as stats. # to missing events in the eve.stats records. See issue #2225. # Add stream events as stats. Statistics can be enabled or disabled here. Statistics are dumped on an interval . Setting this below 3 or 4 seconds is not useful due to how threads are synchronized internally. The decoder events that the decoding layer generates, can create a counter per event type. This behaviour is enabled by default. The decoder-events option can be set to false to disable. In 4.1.x there is a naming clash between the regular decoder counters and the decoder-event counters. This leads to a fair amount of decoder-event counters not being shown in the EVE.stats records. To address this without breaking existing setups, a config option decoder-events-prefix is added to change the naming of the decoder-events from decoder.<proto>.<event> to decoder.event.<proto>.<event>. In 5.0 which will become the default. See issue 2225. Similar to the decoder-events option, the stream-events option controls whether the stream-events are added as counters as well. This is disabled by default. Enabling all of the logs, will result in a much lower performance and the use of more disc space, so enable only the outputs you need. enabled:yes            #This log is enabled. Set to 'no' to disable. filename: fast.log     #The name of the file in the default logging directory. This is an JSON output for alerts and events. It allows for easy integration with 3rd party tools like logstash. # so this setting as to be reserved to high traffic suricata. # Include top level metadata. Default yes. # required if you wish to enable/disable specific fields. # Log the the current state of the flow record. # Log the raw rule text. # Two operation modes are available, "extra-data" and "overwrite". # "forward" deployment the first IP address is used. # one taken into consideration. # rather than an event for each of the answers. # will fallback to 1 for backwards compatibility. # Enable/disable this logger. Default: enabled. # By default both requests and responses are logged. # Answer types to log. # Version 1 (deprecated) DNS logger. #                     # per flow direction. All logs each dropped pkt. # NFS logging. Requires Rust. # IKEv2 logging. Requires Rust. # DHCP logging requires Rust. # to an IP address is logged. # they are set, but will also include the full metadata object. For more advanced configuration options, see Eve JSON Output. The format is documented in Eve JSON Format. This log format is a binary format compatible with the unified2 output of another popular IDS format and is designed for use with Barnyard2 or other tools that consume the unified2 log format. By default a file with the given filename and a timestamp (unix epoch format) will be created until the file hits the configured size limit, then a new file, with a new timestamp will be created. It is the job of other tools, such as Barnyard2 to cleanup old unified2 files. If the nostamp option is set the log file will not have a timestamp appended. The file will be re-opened on SIGHUP like other log files allowing external log rotation tools to work as expected. However, if the limit is reach the file will be deleted and re-opened. This output supports IPv6 and IPv4 events. # unless nostamp is set to yes. # Sensor ID field of unified2 alerts. # false if payload is not required. # direction) with the one reported in the X-Forwarded-For HTTP header. # received, it will fall-back to "extra-data" mode. This alert output needs Barnyard2. This log keeps track of all HTTP-traffic events. It contains the HTTP request, hostname, URI and the User-Agent. This information will be stored in the http.log (default name, in the suricata log directory). This logging can also be performed through the use of the Eve-log capability. enabled: yes                #This log is enabled. Set 'no' to disable. filename: http.log          #The name of the file in the default logging directory. # overwritten while restarting Suricata. extended: yes               # If set to yes more information is written about the event. With the pcap-log option you can save all packets, that are registered by Suricata, in a log file named _log.pcap_. This way, you can take a look at all packets whenever you want. In the normal mode a pcap file is created in the default-log-dir. It can also be created elsewhere if a absolute path is set in the yaml-file. The file that is saved in example the default -log-dir /var/log/suricata, can be be opened with every program which supports the pcap file format. This can be Wireshark, TCPdump, Suricata, Snort and many others. The pcap-log option can be enabled and disabled. If you would like to use Suricata with Sguil, do not forget to enable (and if necessary modify) the base dir in the suricata.yaml file. Remember that in the ‘normal’ mode, the file will be saved in default-log-dir or in the absolute path (if set). The pcap files can be compressed before being written to disk by setting the compression option to lz4. This option is incompatible with sguil mode. Note: On Windows, this option increases disk I/O instead of reducing it. When using lz4 compression, you can enable checksums using the lz4-checksum option, and you can set the compression level lz4-level to a value between 0 and 16, where higher levels result in higher compression. mode: sguil # "normal" (default) or sguil. This is a log type that gives supplementary information about an alert. It is particularly convenient for people who investigate false positives and who write signatures. However, it lowers the performance because of the amount of information it has to store. enabled: no                 #This log is not enabled. Set 'yes' to enable. filename: alert-debug.log   #The name of the file in the default logging directory. To be able to use this type, you have to connect with the prelude manager first. A binary form of the entire packet. Since the last two parts can be very big (especially since they are stored in the Prelude SQL database), they are optional and controlled by the two options ‘log_packet_header’ and ‘log_packet_content’. The default setting is to log the headers, but not the content. The profile name is the name of the Prelude profile used to connect to the prelude manager. This profile must be registered using an external command (prelude-admin), and must match the uid/gid of the user that will run Suricata. The complete procedure is detailed in the Prelude Handbook. enabled: no                #This log is not enabled. Set 'yes' to enable. profile: suricata          #The profile-name used to connect to the prelude manager. log_packet_content: no     #The log_packet_content is disabled by default. log_packet_header: yes     #The log _packet_header is enabled by default. In stats you can set the options for stats.log. When enabling stats.log you can set the amount of time in seconds after which you want the output-data to be written to the log file. #(default-log-dir) it will result in /var/log/suricata/stats.log. #directory starting with / ). The interval and several other options depend on the global stats section as described above. With this option it is possible to send all alert and event output to syslog. - syslog:                       #This is a output-module to direct log-output to several directions. enabled: no                #The use of this output-module is not enabled. facility: local5           #In this option you can set a syslog facility. #Emergency, Alert, Critical, Error, Warning, Notice, Info and Debug. If Suricata works in IPS mode, it can drop packets based on rules. Packets that are being dropped are saved in the drop.log file, a Netfilter log format. enabled: yes              #The option is enabled. filename: drop.log        #The log-name of the file for dropped packets. #overwritten while restarting Suricata. If set to 'no' the last filled drop.log file will be overwritten. The file-store output enables storing of extracted files to disk and configures where they are stored. The following shows the configuration options for version 2 of the file-store output. # This configures version 2 of the file-store. # absolute will be be relative to the default-log-dir. # as a fileinfo record to the main eve-log. # Force storing of all files. Default: no. # to perform file extraction. Set to 0 for unlimited. 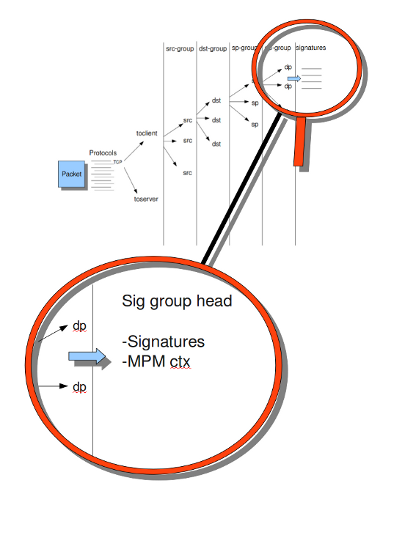 The detection-engine builds internal groups of signatures. Suricata loads signatures, with which the network traffic will be compared. The fact is, that many rules certainly will not be necessary. (For instance: if there appears a packet with the UDP-protocol, all signatures for the TCP-protocol won’t be needed.) For that reason, all signatures will be divided in groups. However, a distribution containing many groups will make use of a lot of memory. Not every type of signature gets its own group. There is a possibility that different signatures with several properties in common, will be placed together in a group. The quantity of groups will determine the balance between memory and performance. A small amount of groups will lower the performance yet uses little memory. The opposite counts for a higher amount of groups. The engine allows you to manage the balance between memory and performance. To manage this, (by determining the amount of groups) there are several general options: high for good performance and more use of memory, low for low performance and little use of memory. The option medium is the balance between performance and memory usage. This is the default setting. The option custom is for advanced users. This option has values which can be managed by the user. At all of these options, you can add (or change) a value. Most signatures have the adjustment to focus on one direction, meaning focusing exclusively on the server, or exclusively on the client. If you take a look at example 4, the Detection-engine grouping tree, you see it has many branches. At the end of each branch, there is actually a ‘sig group head’. Within that sig group head there is a container which contains a list with signatures that are significant for that specific group/that specific end of the branch. Also within the sig group head the settings for Multi-Pattern-Matcher (MPM) can be found: the MPM-context. As will be described again at the part ‘Pattern matching settings’, there are several MPM-algorithms of which can be chosen from. Because every sig group head has its own MPM-context, some algorithms use a lot of memory. For that reason there is the option sgh-mpm-context to set whether the groups share one MPM-context, or to set that every group has its own MPM-context. For setting the option sgh-mpm-context, you can choose from auto, full or single. The default setting is ‘auto’, meaning Suricata selects full or single based on the algorithm you use. ‘Full’ means that every group has its own MPM-context, and ‘single’ that all groups share one MPM-context. The two algorithms ac and ac-gfbs are new in 1.03. These algorithms use a single MPM-context if the Sgh-MPM-context setting is ‘auto’. The rest of the algorithms use full in that case. The inspection-recursion-limit option has to mitigate that possible bugs in Suricata cause big problems. Often Suricata has to deal with complicated issues. It could end up in an ‘endless loop’ due to a bug, meaning it will repeat its actions over and over again. With the option inspection-recursion-limit you can limit this action. src             Stands for source IP-address. dst             Stands for destination IP-address. sp              Stands for source port. dp              Stands for destination port. The concept of prefiltering is that there are far too many rules to inspect individually. The approach prefilter takes is that from each rule one condition is added to prefilter, which is then checked in one step. 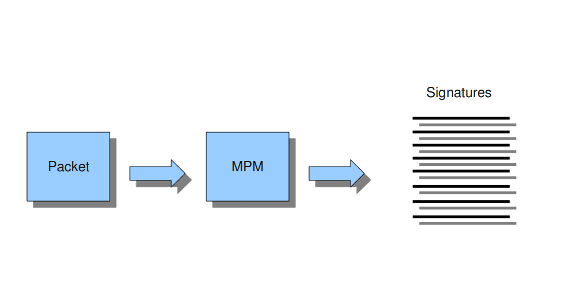 The most common example is MPM (also known as fast_pattern). This takes a single pattern per rule and adds it to the MPM. Only for those rules that have at least one pattern match in the MPM stage, individual inspection is performed. Next to MPM, other types of keywords support prefiltering. ICMP itype, icode, icmp_seq and icmp_id for example. TCP window, IP TTL are other examples. Suricata can automatically select prefilter options, or it can be set manually. By default, only MPM/fast_pattern is used. The prefilter engines for other non-MPM keywords can then be enabled in specific rules by using the ‘prefilter’ keyword. The multi-pattern-matcher (MPM) is a part of the detection engine within Suricata that searches for multiple patterns at once. Generally, signatures have one ore more patterns. Of each signature, one pattern is used by the multi-pattern-matcher. That way Suricata can exclude many signatures from being examined, because a signature can only match when all its patterns match. 3)All patterns that match, will be further processed by Suricata (signatures). Suricata offers various implementations of different multi-pattern-matcher algorithm’s. These can be found below. After ‘mpm-algo’, you can enter one of the following algorithms: b2g, b2gc, b2gm, b3g, wumanber, ac and ac-gfbs (These last two are new in 1.0.3). For more information about these last two, please read again the the end of the part ‘Detection engine’. These algorithms have no options, so the fact that below there is no option being mentioned is no omission. Subsequently, you can set the options for the mpm-algorithm’s. The bf_size option determines the size of the bloom filter, that is used with the final step of the pattern matcher, namely the validation of the pattern. For this option the same counts as for the hash-size option: setting it to low will cause lower memory usage, but lowers the performance. The opposite counts for a high setting of the bf_size: higher memory usage, but (generally) higher performance. The bloom-filter sizes can vary from low (512) - medium (1024) - high (2048). hash_size: low                    #Determines the size of the hash-table. bf_size: medium                   #Determines the size of the bloom- filter. hash_size: low                    #See hash-size -b2gc. bf_size: medium                   #See bf-size -b2gc. 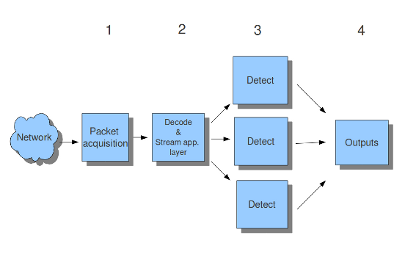 There are four thread-modules: Packet acquisition, decode and stream application layer, detection, and outputs. # The packet acquisition module reads packets from the network. First: it performs stream-tracking, meaning it is making sure all steps will be taken to make a correct network-connection. Second: TCP-network traffic comes in as packets. 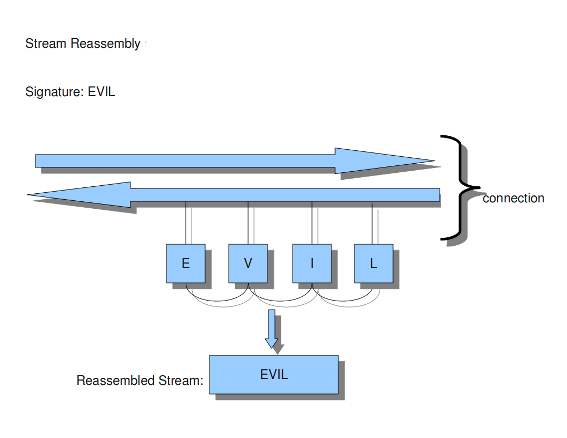 The Stream-Assembly engine reconstructs the original stream. Finally: the application layer will be inspected. HTTP and DCERPC will be analyzed. # The detection threads will compare signatures. There can be several detection threads so they can operate simultaneously. # In Outputs all alerts and events will be processed. Stream app. Layer:              Performs stream-tracking and reassembly. Outputs:                        Processes all events and alerts. Most computers have multiple CPU’s/ CPU cores. By default the operating system determines which core works on which thread. When a core is already occupied, another one will be designated to work on the thread. So, which core works on which thread, can differ from time to time. With this option you can cause Suricata setting fixed cores for every thread. In that case 1, 2 and 4 are at core 0 (zero). Each core has its own detect thread. The detect thread running on core 0 has a lower priority than the other threads running on core 0. If these other cores are to occupied, the detect thread on core 0 has not much packets to process. The detect threads running on other cores will process more packets. This is only the case after setting the option to ‘yes’. The detect thread-ratio will determine the amount of detect threads. By default it will be 1.5 x the amount of CPU’s/CPU cores present at your computer. This will result in having more detection threads then CPU’s/ CPU cores. Meaning you are oversubscribing the amount of cores. This may be convenient at times when there have to be waited for a detection thread. The remaining detection thread can become active. 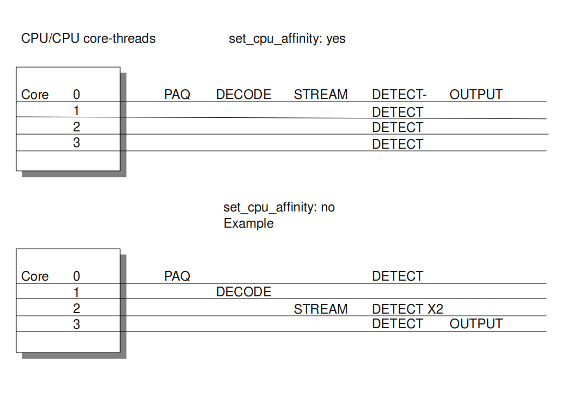 In the option ‘cpu affinity’ you can set which CPU’s/cores work on which thread. In this option there are several sets of threads. The management-, receive-, worker- and verdict-set. These are fixed names and can not be changed. For each set there are several options: cpu, mode, and prio. In the option ‘cpu’ you can set the numbers of the CPU’s/cores which will run the threads from that set. You can set this option to ‘all’, use a range (0-3) or a comma separated list (0,1). The option ‘mode’ can be set to ‘balanced’ or ‘exclusive’. When set to ‘balanced’, the individual threads can be processed by all cores set in the option ‘cpu’. If the option ‘mode’ is set to ‘exclusive’, there will be fixed cores for each thread. As mentioned before, threads can have different priority’s. In the option ‘prio’ you can set a priority for each thread. This priority can be low, medium, high or you can set the priority to ‘default’. If you do not set a priority for a CPU, than the settings in ‘default’ will count. By default Suricata creates one ‘detect’ (worker) thread per available CPU/CPU core. Occasionally network packets appear fragmented. On some networks it occurs more often than on others. Fragmented packets exist of many parts. Before Suricata is able to inspect these kind of packets accurately, the packets have to be reconstructed. This will be done by a component of Suricata; the defragment-engine. After a fragmented packet is reconstructed by the defragment-engine, the engine sends on the reassembled packet to rest of Suricata. There are three options within defrag: max-frags, prealloc and timeout. At the moment Suricata receives a fragment of a packet, it keeps in memory that other fragments of that packet will appear soon to complete the packet. However, there is a possibility that one of the fragments does not appear. To prevent Suricata for keeping waiting for that packet (thereby using memory) there is a timespan after which Suricata discards the fragments. This occurs by default after 60 seconds. Within Suricata, Flows are very important. They play a big part in the way Suricata organizes data internally. A flow is a bit similar to a connection, except a flow is more general. All packets having the same Tuple (protocol, source IP, destination IP, source-port, destination-port), belong to the same flow. 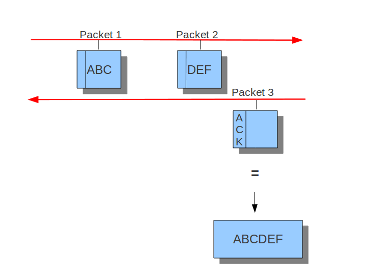 Packets belonging to a flow are connected to it internally. Keeping track of all these flows, uses memory. The more flows, the more memory it will cost. For packets not yet belonging to a flow, Suricata creates a new flow. This is a relative expensive action. The risk coming with it, is that attackers /hackers can a attack the engine system at this part. When they make sure a computer gets a lot of packets with different tuples, the engine has to make a lot of new flows. This way, an attacker could flood the system. To mitigate the engine from being overloaded, this option instructs Suricata to keep a number of flows ready in memory. This way Suricata is less vulnerable to these kind of attacks. The flow-engine has a management thread that operates independent from the packet processing. This thread is called the flow-manager. This thread ensures that wherever possible and within the memcap. there will be 10000 flows prepared. memcap: 33554432              #The maximum amount of bytes the flow-engine will make use of. Prealloc: 10000               #The amount of flows Suricata has to keep ready in memory. At the point the memcap will still be reached, despite prealloc, the flow-engine goes into the emergency-mode. In this mode, the engine will make use of shorter time-outs. It lets flows expire in a more aggressive manner so there will be more space for new Flows. There are two options: emergency_recovery and prune_flows. The emergency recovery is set on 30. This is the percentage of prealloc’d flows after which the flow-engine will be back to normal (when 30 percent of the 10000 flows is completed). If during the emergency-mode, the aggressive time-outs do not have the desired result, this option is the final resort. It ends some flows even if they have not reached their time-outs yet. The prune-flows option shows how many flows there will be terminated at each time a new flow is set up. emergency_recovery: 30                  #Percentage of 1000 prealloc'd flows. prune_flows: 5                          #Amount of flows being terminated during the emergency mode. The amount of time Suricata keeps a flow in memory is determined by the Flow time-out. There are different states in which a flow can be. 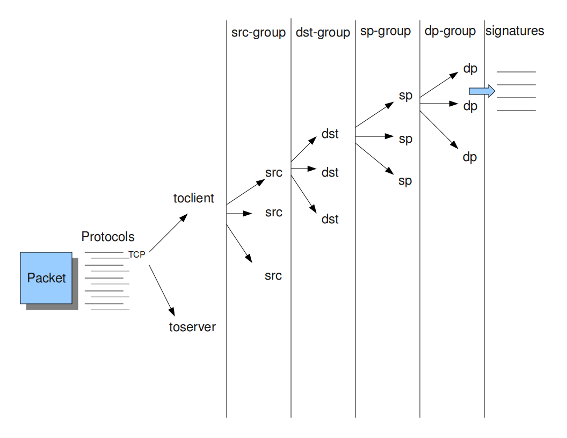 Suricata distinguishes three flow-states for TCP and two for UDP. For TCP, these are: New, Established and Closed,for UDP only new and established. For each of these states Suricata can employ different timeouts. The state new in a TCP-flow, means the period during the three way handshake. The state established is the state when the three way handshake is completed. The state closed in the TCP-flow: there a several ways to end a flow. This is by means of Reset or the Four-way FIN handshake. New in a UDP-flow: the state in which packets are send from only one direction. 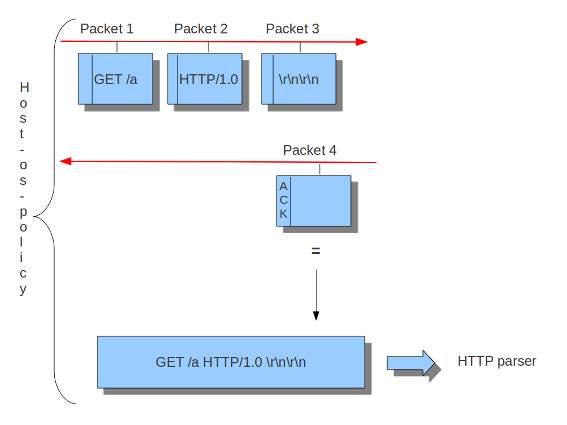 Established in a UDP-flow: packets are send from both directions. In the example configuration the are settings for each protocol. TCP, UDP, ICMP and default (all other protocols). new: 30                     #Time-out in seconds after the last activity in this flow in a New state. #state in the emergency mode. The Stream-engine keeps track of the TCP-connections. The engine exists of two parts: The stream tracking- and the reassembly-engine. The stream-tracking engine monitors the state of a connection. The reassembly-engine reconstructs the flow as it used to be, so it will be recognized by Suricata. The stream-engine has two memcaps that can be set. One for the stream-tracking-engine and one for the reassembly-engine. The stream-tracking-engine keeps information of the flow in memory. 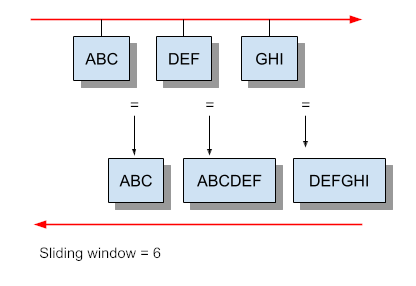 Information about the state, TCP-sequence-numbers and the TCP window. For keeping this information, it can make use of the capacity the memcap allows. TCP packets have a so-called checksum. This is an internal code which makes it possible to see if a packet has arrived in a good state. The stream-engine will not process packets with a wrong checksum. This option can be set off by entering ‘no’ instead of ‘yes’. checksum_validation: yes    # Validate packet checksum, reject packets with invalid checksums. To mitigate Suricata from being overloaded by fast session creation, the option prealloc_sessions instructs Suricata to keep a number of sessions ready in memory. A TCP-session starts with the three-way-handshake. After that, data can be send en received. A session can last a long time. It can happen that Suricata will be started after a few TCP sessions have already been started. This way, Suricata misses the original setup of those sessions. This setup always includes a lot of information. If you want Suricata to check the stream from that time on, you can do so by setting the option ‘midstream’ to ‘true’. The default setting is ‘false’. Normally Suricata is able to see all packets of a connection. Some networks make it more complicated though. Some of the network-traffic follows a different route than the other part, in other words: the traffic goes asynchronous. To make sure Suricata will check the one part it does see, instead of getting confused, the option ‘async-oneside’ is brought to life. By default the option is set to ‘false’. Suricata inspects content in the normal/IDS mode in chunks. In the inline/IPS mode it does that on the sliding window way (see example ..) In the case Suricata is set in inline mode, it has to inspect packets immediately before sending it to the receiver. 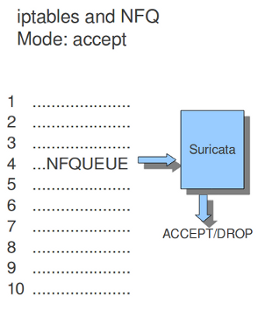 This way Suricata is able to drop a packet directly if needed. (see example …) It is important for Suricata to note which operating system it is dealing with, because operating systems differ in the way they process anomalies in streams. See Host-os-policy. The ‘drop-invalid’ option can be set to no to avoid blocking packets that are seen invalid by the streaming engine. This can be useful to cover some weird cases seen in some layer 2 IPS setup. Suricata inspects traffic in chunks. Suricata inspects traffic in a sliding window manner. The reassembly-engine has to keep data segments in memory in order to be able to reconstruct a stream. To avoid resource starvation a memcap is used to limit the memory used. Reassembling a stream is an expensive operation. With the option depth you can control how far into a stream reassembly is done. By default this is 1MB. This setting can be overridden per stream by the protocol parsers that do file extraction. Inspection of reassembled data is done in chunks. The size of these chunks is set with toserver_chunk_size and toclient_chunk_size. To avoid making the borders predictable, the sizes van be varied by adding in a random factor. depth: 1mb                # The depth of the reassembling. Incoming segments are stored in a list in the stream. To avoid constant memory allocations a per-thread pool is used. Resending different data on the same sequence number is a way to confuse network inspection. Asn1 (Abstract Syntax One) is a standard notation to structure and describe data. Within Asn1_max_frames there are several frames. To protect itself, Suricata will inspect a maximum of 256. You can set this amount differently if wanted. Application layer protocols such as X.400 electronic mail, X.500 and LDAP directory services, H.323 (VoIP), BACnet and SNMP, use ASN.1 to describe the protocol data units (PDUs) they exchange. It is also extensively used in the Access and Non-Access Strata of UMTS. The library Libhtp is being used by Suricata to parse HTTP-sessions. While processing HTTP-traffic, Suricata has to deal with different kind of servers which each process anomalies in HTTP-traffic differently. The most common web-server is Apache. This is a open source web -server program. Beside Apache, IIS (Internet Information Services/Server)a web-server program of Microsoft is also well-known. Like with host-os-policy, it is important for Suricata to which IP-address/network-address is used by which server. In Libhtp this assigning of web-servers to IP-and network addresses is called personality. You can assign names to each block of settings. Which in this case is -apache and -iis7. Under these names you can set IP-addresses, network-addresses the personality and the request-body-limit. The version-specific personalities know exactly how web servers behave, and emulate that. The IDS personality (will be GENERIC in the future) would try to implement a best-effort approach that would work reasonably well in the cases where you do not know the specifics. The default configuration also applies to every IP-address for which no specific setting is available. HTTP request body’s are often big, so they take a lot of time to process which has a significant impact on the performance. With the option ‘request-body-limit’ you can set the limit (in bytes) of the client-body that will be inspected. Setting it to 0 will inspect all of the body. HTTP response body’s are often big, so they take a lot of time to process which has a significant impact on the performance. With the option ‘response-body-limit’ you can set the limit (in bytes) of the server-body that will be inspected. Setting it to 0 will inspect all of the body. As of 1.4, Suricata makes available the whole set of libhtp customisations for its users. You can now use these parameters in the conf to customise suricata’s use of libhtp. # separators. They are not on Unix systems, but are on Windows systems. # converted to "/one/two/three". Accepted values - yes, no. # "/one/two/three/four". Accepted values - yes, no. # single byte stream using best-fit mapping. Accepted values - yes, no. # Configures whether encoded path segment separators will be decoded. # forward slashes). Accepted values - yes, no. # desireable. Accepted values - yes, no. # Configures how server reacts to invalid UTF-8 characters in path. # characters. Accepted values - none, status_400. # path. Accepted values - none, terminate, status_400, status_404. # best-fit mapping from Unicode characters into single-byte streams. # The question mark is the default replacement character. # where only a single-byte would do (e.g., the %u-encoded characters). # probably be an option to convert such characters to UCS-2 or UTF-8. # Accepted values - bestfit, status_400 and status_404. The SMB parser will parse version 1, 2 and 3 of the SMB protocol over TCP. To enable the parser add the following to the app-layer section of the YAML. The parser uses pattern based protocol detection and will fallback to probing parsers if the pattern based detection fails. As usual, the pattern based detection is port independent. The probing parsers will only run on the detection-ports. SMB is commonly used to transfer the DCERPC protocol. This traffic is also handled by this parser. The logging subsystem can display all output except alerts and events. It gives information at runtime about what the engine is doing. This information can be displayed during the engine startup, at runtime and while shutting the engine down. For informational messages, errors, debugging, etc. Error, warning, informational and debug. Note that debug level logging will only be emitted if Suricata was compiled with the –enable-debug configure option. The first option within the logging configuration is the default-log-level. This option determines the severity/importance level of information that will be displayed. Messages of lower levels than the one set here, will not be shown. The default setting is Info. This means that error, warning and info will be shown and the other levels won’t be. There are more levels: emergency, alert, critical and notice, but those are not used by Suricata yet. This option can be changed in the configuration, but can also be overridden in the command line by the environment variable: SC_LOG_LEVEL . default-log-format: "[%i] %t - (%f:%l) <%d> (%n) -- "
p:      Process ID. 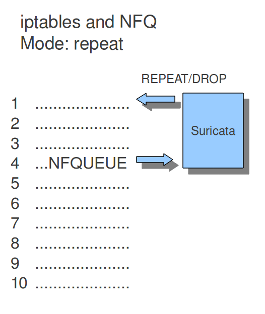 Suricata's whole processing consists of multiple threads. i:      Thread ID. ID of individual threads. f:      Filename. Name of C-file (source code) where log-event is generated. l:      Line-number within the filename, where the log-event is generated in the source-code. n:      Function-name in the C-code (source code). The last three, f, l and n are mainly convenient for developers. Within logging you can set an output-filter. With this output-filter you can set which part of the event-logs should be displayed. You can supply a regular expression (Regex). A line will be shown if the regex matches. default-output-filter:               #In this option the regular expression can be entered. - console:                                    #Output on your screen. enabled: yes                              #This option is enabled. - file:                                       #Output stored in a file. enabled: no                               #This option is not enabled. filename: /var/log/suricata.log           #Filename and location on disc. - syslog:                                     #This is a program to direct log-output to several directions. enabled: no                               #The use of this program is not enabled. facility: local5                          #In this option you can set a syslog facility. format: "[%i] <%d> -- "                   #The option to set your own format. The Pf_ring is a library that aims to improve packet capture performance over libcap. It performs packet acquisition. There are three options within Pf_ring: interface, cluster-id and cluster-type. # on which you want the packets of the network to be read. Pf_ring will load balance packets based on flow. All packet acquisition threads that will participate in the load balancing need to have the same cluster-id. It is important to make sure this ID is unique for this cluster of threads, so that no other engine / program is making use of clusters with the same id. Pf_ring can load balance traffic using pf_ring-clusters. All traffic for pf_ring can be load balanced in one of two ways, in a round robin manner or a per flow manner that are part of the same cluster. All traffic for pf_ring will be load balanced across acquisition threads of the same cluster id. The cluster_round_robin manner is a way of distributing packets one at a time to each thread (like distributing playing cards to fellow players). 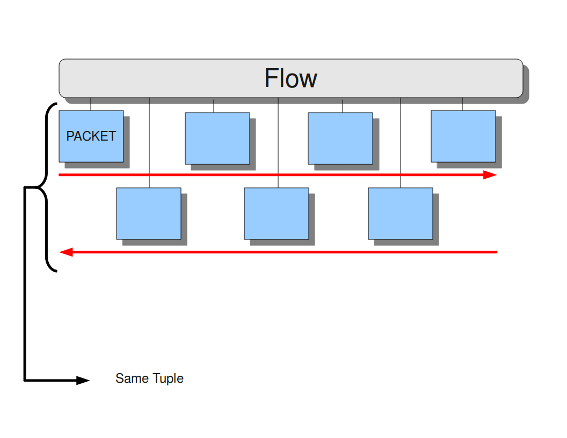 The cluster_flow manner is a way of distributing all packets of the same flow to the same thread. The flows itself will be distributed to the threads in a round-robin manner. 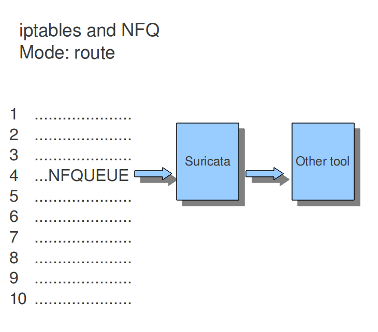 Using NFQUEUE in iptables rules, will send packets to Suricata. If the mode is set to ‘accept’, the packet that has been send to Suricata by a rule using NFQ, will by default not be inspected by the rest of the iptables rules after being processed by Suricata. There are a few more options to NFQ to change this if desired. If the mode is set to ‘repeat’, the packets will be marked by Suricata and be re-injected at the first rule of iptables. To mitigate the packet from being going round in circles, the rule using NFQ will be skipped because of the mark. If the mode is set to ‘route’, you can make sure the packet will be send to another tool after being processed by Suricata. It is possible to assign this tool at the mandatory option ‘route_queue’. Every engine/tool is linked to a queue-number. This number you can add to the NFQ rule and to the route_queue option. #send the packets to after processing them. Suricata does not only support Linux, it supports the FreeBSD operating system (this is an open source Unix operating system) and Mac OS X as well. 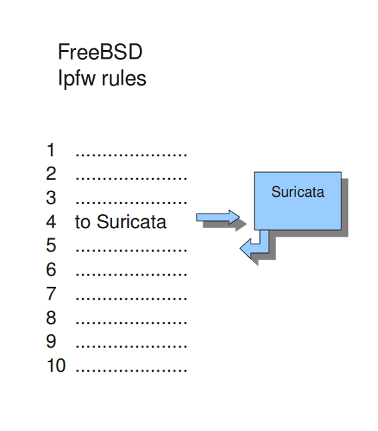 The in-line mode on FreeBSD uses ipfw (IP-firewall). Certain rules in ipfw send network-traffic to Suricata. Rules have numbers. In this option you can set the rule to which the network-traffic will be placed back. Make sure this rule comes after the one that sends the traffic to Suricata, otherwise it will go around in circles. For different categories of risk there are different rule-files available containing one or more rules. There is a possibility to instruct Suricata where to find these rules and which rules you want to be load for use. You can set the directory where the files can be found. The above mentioned is an example of rule-files of which can be chosen from. There are much more rule-files available. If wanted, you can set a full path for a specific rule or rule-file. In that case, the above directory (/etc/suricata/rules/) will be ignored for that specific file. This is convenient in case you write your own rules and want to store them separate from other rules like that of VRT, ET or ET pro. If you set a file-name that appears to be not existing, Suricata will ignore that entry and display a error-message during the engine startup. It will continue with the startup as usual. The Classification-file is a file which makes the purpose of rules clear. Some rules are just for providing information. Some of them are to warn you for serious risks like when you are being hacked etc. In this classification-file, there is a part submitted to the rule to make it possible for the system-administrator to distinguish events. A rule in this file exists of three parts: the short name, a description and the priority of the rule (in which 1 has the highest priority and 4 the lowest). You can notice these descriptions returning in the rule and events / alerts. You can set the direction of the classification configuration. There are variables which can be used in rules. Within rules, there is a possibility to set for which IP-address the rule should be checked and for which IP-address it should not. This way, only relevant rules will be used. To prevent you from having to set this rule by rule, there is an option in which you can set the relevant IP-address for several rules. This option contains the address group vars that will be passed in a rule. So, after HOME_NET you can enter your home IP-address. It is a convention to use upper-case characters. There are two kinds of variables: Address groups and Port-groups. They both have the same function: change the rule so it will be relevant to your needs. In a rule there is a part assigned to the address and one to the port. Both have their variable. All options have to be set. If it is not necessary to set a specific address, you should enter ‘any’. Operating systems differ in the way they process fragmented packets and streams. Suricata performs differently with anomalies for different operating systems. It is important to set of which operating system your IP-address makes use of, so Suricata knows how to process fragmented packets and streams. 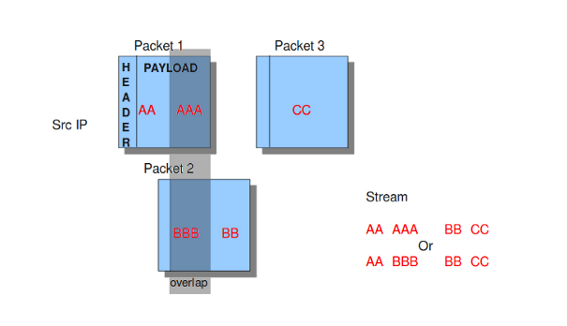 For example in stream-reassembly there can be packets with overlapping payloads. In the configuration-file, the operating-systems are listed. You can add your IP-address behind the name of the operating system you make use of. Suricata offers several ways of analyzing performance of rules and the engine itself. The option engine-analysis provides information for signature writers about how Suricata organizes signatures internally. Like mentioned before, signatures have zero or more patterns on which they can match. Only one of these patterns will be used by the multi pattern matcher (MPM). Suricata determines which patterns will be used unless the fast-pattern rule option is used. The option engine-analysis creates a new log file in the default log dir. In this file all information about signatures and patterns can be found so signature writers are able to see which pattern is used and change it if desired. To create this log file, you have to run Suricata with ./src/suricata -c suricata.yaml –engine-analysis. Rule profiling is a part of Suricata to determine how expensive rules are. Some rules are very expensive while inspecting traffic. Rule profiling is convenient for people trying to track performance problems and resolving them. Also for people writing signatures. Compiling Suricata with rule-profiling will have an impact on performance, even if the option is disabled in the configuration file. To observe the rule-performance, there are several options. At the end of each session, Suricata will display the profiling statistics. The list will be displayed sorted. This order can be changed as pleased. The choice is between ticks, avgticks, checks, maxticks and matches. The setting of your choice will be displayed from high to low. The amount of time it takes to check the signatures, will be administrated by Suricata. This will be counted in ticks. One tick is one CPU computation. 3 GHz will be 3 billion ticks. Beside the amount of checks, ticks and matches it will also display the average and the maximum of a rule per session at the end of the line. The option Limit determines the amount of signatures of which the statistics will be shown, based on the sorting. # performance impact if compiled in. #information that was saved last in the file. enabled: no                                #the sending of packet output to a csv-file is by default disabled. Packet profiling is enabled by default in suricata.yaml but it will only do its job if you compiled Suricata with –enable profiling. The filename in which packet profiling information will be stored, is packet-stats.log. Information in this file can be added to the last information that was saved there, or if the append option is set to no, the existing file will be overwritten. Per packet, you can send the output to a csv-file. This file contains one line for each packet with all profiling information of that packet. This option can be used only if Suricata is build with –enable-profiling and if the packet profiling option is enabled in yaml. It is best to use runmode ‘single’ if you would like to profile the speed of the code. When using a single thread, there is no situation in which two threads have to wait for each other. When using two threads, the time threads might have to wait for each other will be taken in account when/during profiling packets. For more information see Packet Profiling. SSL/TLS parsers track encrypted SSLv2, SSLv3, TLSv1, TLSv1.1 and TLSv1.2 sessions. Protocol detection is done using patterns and a probing parser running on only TCP/443 by default. The pattern based protocol detection is port independent. #            or hardware if possible. #            keyword signatures are inspected as well. # For best performance, select 'bypass'. There is no decryption of encrypted traffic, so once the handshake is complete continued tracking of the session is of limited use. The encrypt-handling option controls the behavior after the handshake. If encrypt-handling is set to default (or if the option is not set), Suricata will continue to track the SSL/TLS session. Inspection will be limited, as raw content inspection will still be disabled. There is no point in doing pattern matching on traffic known to be encrypted. Inspection for (encrypted) Heartbleed and other protocol anomalies still happens. When encrypt-handling is set to bypass, all processing of this session is stopped. No further parsing and inspection happens. 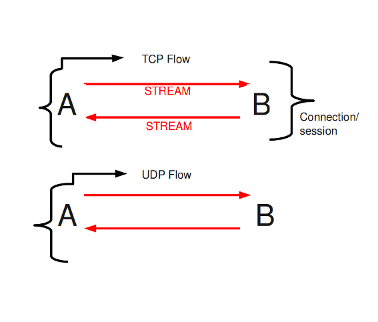 If stream.bypass is enabled this will lead to the flow being bypassed, either inside Suricata or by the capture method if it supports it and is configured for it. Finally, if encrypt-handling is set to full, Suricata will process the flow as normal, without inspection limitations or bypass. The option has replaced the no-reassemble option. If no-reassemble is present, and encrypt-handling is not, false is intepreted as encrypt-handling: default and true is interpreted as encrypt-handling: bypass. According to MODBUS Messaging on TCP/IP Implementation Guide V1.0b, it is recommended to keep the TCP connection opened with a remote device and not to open and close it for each MODBUS/TCP transaction. In that case, it is important to set the stream-depth of the modbus as unlimited. SMTP parsers can extract files from attachments. It is also possible to extract raw conversations as files with the key raw-extraction. Note that in this case the whole conversation will be stored as a file, including SMTP headers and body content. The filename will be set to “rawmsg”. Usual file-related signatures will match on the raw content of the email. This configuration parameter has a false default value. It is incompatible with decode-mime. If both are enabled, raw-extraction will be automatically disabled. The Teredo decoder can be disabled. It is enabled by default. # it will sometimes detect non-teredo as teredo. Luajit has a strange memory requirement, it’s ‘states’ need to be in the first 2G of the process’ memory. For this reason when luajit is used the states are allocated at the process startup. This option controls how many states are preallocated. If the pool is depleted a warning is generated. Suricata will still try to continue, but may fail if other parts of the engine take too much memory. If the pool was depleted a hint will be printed at the engines exit. States are allocated as follows: for each detect script a state is used per detect thread. For each output script, a single state is used. Keep in mind that a rule reload temporary doubles the states requirement.